The BDP held its first congress on Monday in Ankara and elected Diyarbakır deputies Selahattin Demirtaş and Gülten Kışanak as the co-chairpersons of the party. 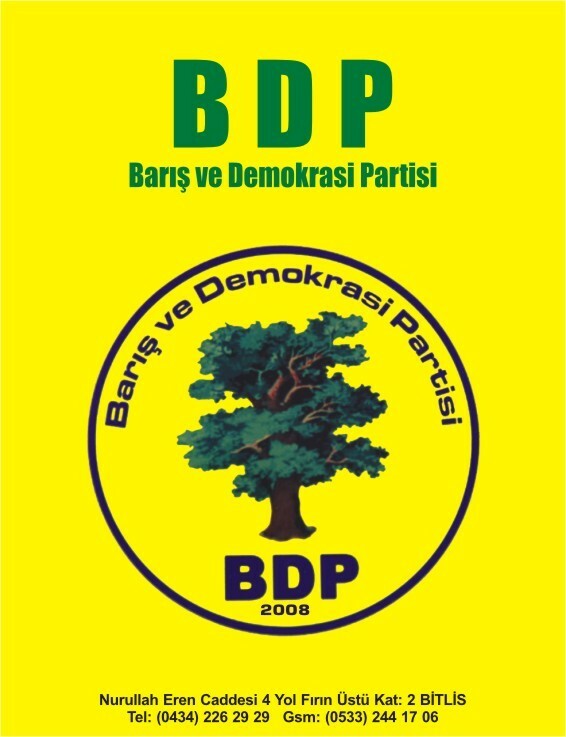 The pro-Kurdish BDP (Barış ve Demokrasi Partisi/Peace and Democracy Party) was formed in 2008 and replaced the Democratic Society Party (DTP) when it was closed down in December of last year. Yesterday, one day after congress, the Ankara Public Prosecutor’s Office launched an investigation into the BDP congress for alleged crimes of ‘turning people against the military,’ ‘contradicting the Political Parties Act’ and ‘praising crime and criminals.’ Or maybe the Prosecutor’s Office was upset because the Turkish national anthem was not played at the opening of the meeting? Journalist Gültan Kışanak was born on 15 June 1961 in Elazığ. She graduated from Ege University Communication Facutly in Journalism and Public Relations. Kışanak worked for various newspapers as a journalist. She ran several projects as co-ordinator and consultant for the Bağlar Municipality Social Project in Diyarbakır in eastern Turkey. With an independent candidacy she was elected Diyarbakır MP on 22 July 2007 and joined the DTP group. The new investigation only strengthens Yaman’s argument. In Kışanak’s speech to the congress, attended by some 2,000 delegates, Kışanak criticised the ruling AKP saying that ‘they have crippled rights and freedoms.’ She also said Abdullah Öcalan’s mission was important for peace. 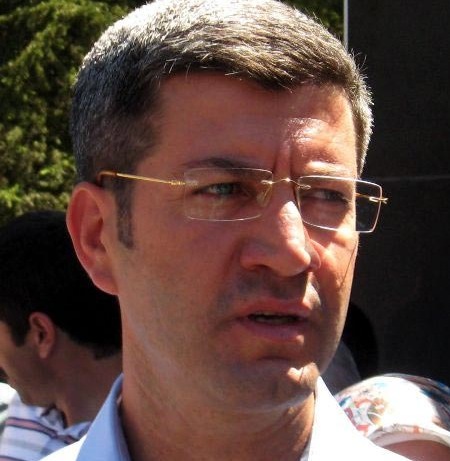 Selahattin Demirtaş, a lawyer, was born on 10 April 1973 in Palu. He graduated from Law School at Ankara University and eventually became President of the Human Rights Association, Diyarbakır Branch. He is also member of the Human Rights Foundation of Turkey and the Turkish branch of Amnesty Internt'l. As his colleague Kışanak, Demirtaş was elected Diyarbakır MP as independent candidate in the elections on 22 July 2007 and joined the DTP group. Demirtaş strongly pushed for linguistic and cultural civil disobedience. He asked Kurdish artists to produce works in Kurdish. He requested that teachers and doctors in predominantly Kurdish areas use Kurdish in the course of their jobs. He suggested university students should engage in stronger campaigns for education in Kurdish. The prosecutor will request records of the congress from security forces, but apparently the police department in Ankara could not get the needed court permission from the courts to record the session. In the past, events at congresses of successive pro-Kurdish political parties have all been recorded by police forces and the tapes were handed over to prosecutors to be used in cases opened against the parties. The police department appealed the decision, but the upper court upheld the ruling. So police do not have recordings of the events inside the congress hall, but they recorded events outside the congress hall where another 2,000 people were chanting slogans and waving banners. 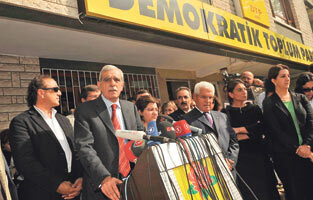 Turkey’s new pro-Kurdish party faces investigation, Hürriyet Daily News, 02 February 2010. Korkut, Tolga. New Co-Chairs for Peace and Democracy Party. BİA News Center, 02 February 2010. Public prosecutor launches investigation into pro-Kurdish BDP. Today’s Zaman, 02 February 2010. Turkish police are searching for former DTP deputies Aysel Tuğluk, Ahmet Türk, Selahattin Demirtaş and Emine Ayna after they failed to appear in court. They staged a raid at the BDP headquarters in Ankara this morning looking for the four. Officers left the premises after fifteen minutes without locating them. The four face charges of promoting the PKK. Charges against former DTP head, Ahmet Türk, stem from statements he made after a meeting with former members of the closed DTP, Democratic Society Party. The investigation launched by the ‘Bureau on Media Crimes’ will be conducted in the context of charges pursuant to Article 215 ‘praising the crime and the criminal’, and Article 216 ‘inciting hatred and hostility’ of the Turkish penal codes. 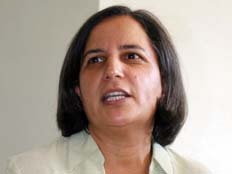 Former DTP deputy Aysel Tuğluk was sentenced in October of 2009 to 18 months in jail for ‘spreading the propaganda of a terrorist organisation’ in remarks favouring the PKK in a speech made at a rally in Diyarbakır in 2006. In the speech, made before she was elected to parliament, Tuğluk praised a declaration signed by tens of thousands of Kurds upholding Öcalan as their leader. Tuğluk faces several other charges and could receive up to a 50-year sentence if convicted of all charges. 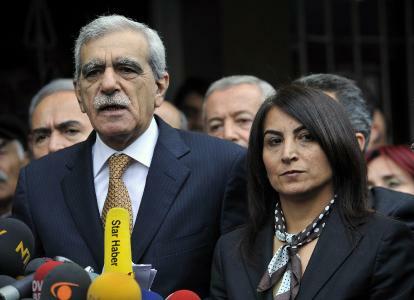 Türk and Tuğluk were removed from Parliament and banned from participating in politics for the next five years by the Turkish Constitutional Court on 11 December 2009. But according to CNNTürk, as the verdict has not yet been published in the Official Gazette, the former deputies technically still enjoy immunity from prosecution and questioning. Demirtaş and Ayna are still sitting deputies and therefore have immunity from prosecution. The four members are refusing to make a deposition, saying that, as deputies, they had parliamentary immunity and therefore could not be judged. The court, however, said the former DTP members were accused of being involved in separatist activities, which made it impossible for the deputies to exercise their right to immunity from prosecution under Article 14 of the Turkish Constitution. This photograph of the 35 detainees, handcuffed, as they enter the court to give testimony, has caused outrage among many. Sezgin Tanrıkulu, former chairman of Diyarbakır Bar Association, says the handcuffing is illegal. News of the warrants for the four deputies comes on the heels of last week’s raids by the security forces around the country against the KCK, or Kurdish Democratic Council (Koma Civakên Kurdistan), an umbrella organisation which includes the PKK. More than 80 former DTP members, mayors, and human rights activists were detained. Many have been released, but the massive arrests have led to more outbreaks of violence in the streets. A Diyarbakır court is still holding 23 people in detention of the 35 detained on 24 December. Turkish court orders Kurdish lawmakers to be forcibly brought to trial. Hürriyet Daily News, 29 December 2009. Ankara Republican Prosecutor opens an investigation on Ahmet Türk. Turkish Press.com, 22 December 2009. Kurdish Politicians Kept in Detention. Bianet, 28 December 2009. In an early morning raid today, across 11 provinces, Turkish police arrested more than 40 individuals. Most of those detained were Kurdish politician from the now-banned DTP, including mayors of Sur, Abdullah Demirbaş, and Siirt, Selim Sadak. Also arrested were DTP provincial chairperson, Fırat Anlı, and Vice President of the Human Rights Association and President of the Diyarbakır branch of the HRA, Muharrem Erbey. Below is a New Year’s message from Erbey sent out yesterday via e-mail. We’ve come to the final days of 2009. At the start of every new year, accounting is done for the events that occurred in the previous year and promises are made regarding the coming one. We hope that the serious questions regarding the exercise of fundamental rights and liberties are put to an end and that what has been experienced in Turkey in the fields of democracy and human rights in the last year won’t be experienced again. In the year 2009, claims of torture and maltreatment, the security forces’ near beating to death of children and demonstrators in the streets and the killing of some, and crimes against humanity in prisons continued, as did serious obstructions in the laws regarding and implementation of the freedoms of thought, expression and association. 3 major operations were carried out against the Democratic Society Party (Demokratic Toplum Partisi – DTP) following the local elections held on 29 March. More than 1,500 people were detained. 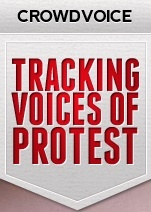 600 DTP activists have been held in custody for 8 months without knowing what they’re being charged with. DTP became the 27th party to be closed in Turkey. In the Progress Report regarding Turkey’s EU candidacy published on 13 October 2009, it’s stated that Turkey has made progress in economic competition, matters related to statistics and scientific research but that there have been very serious regression in the areas of democracy and human rights. Children have continued to be tried and faced with sentences of between 10 and 25 years in prison for making the ‘V’ for victory sign with their fingers. Discussing the Kurdish question in the Turkish Parliament as part of the ‘democratic opening’ was a considerably important step. However it’s a step that’s been deprived of any implementation, as it hasn’t stopped the deaths of people and the blood of brothers and sisters continues to flow. States are legitimized by the extent to which they comply with human rights. The violations in Turkey are continuing. However, we haven’t lost our dreams of or beliefs in social peace, the peaceful co-existence of Turks and Kurds in a spirit of brotherhood within a democratic Turkey, or of Turkey’s EU accession, and nor will we lose these. As the Human Rights Association, for 22 years we’ve repeatedly gotten to the bottom of the truth in an independent and impartial way. Our office was bombed in 1993. We didn’t give up. 22 of our members have been killed. We haven’t given up. Our organization has been closed and its archives confiscated scores of times. We haven’t given up. About one thousand investigations and hundreds of lawsuits have been opened against the presidents of our branches. We haven’t given up. We’ve been threatened. We haven’t given up. We’re not going to give up. We’re going to continue to follow and report on human rights violations and to share our findings with the public. Both as an individual and in the name of the Human Rights Association I wish you all a happy new year in a spirit of peace. The Constitutional Court’s closure of the pro-Kurdish DTP highlights the flaws of the Turkish ‘democracy’ more than any recent event. It is now apparent to the entire world that legal and constitutional standards in Turkey simply do not measure up to international democratic ideals. The decision to ban the DTP marks a colossal step backwards for human rights, democratisation and Kurdish rights in the country. Two months ago there was an air of optimism as Kurdish refugees from Mexmur and PKK fighters from the Qandils crossed back into Turkey. The AKP’s Democratic Initiative was underway. Last month the AKP announced details of the historic plan. Kurds were hopeful, yet holding their breath. But not everyone was happy. Nationalists and conservatives in particular were demonstrably upset. The judiciary, staunch conservatives, believe that the Kurds and the Kurdish political movement represented by the DTP are a threat to the ‘indivisible integrity of the state’ because of their close ties to the PKK. Such being the case, in their view, the party had to be disbanded to protect the state. 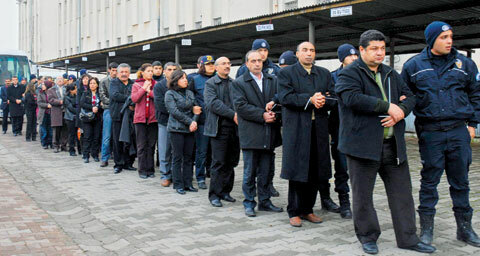 But at the same time, could this have been a strike against the AKP and its initiative to give more rights to the Kurds? With the DTP effectively silenced in parliament, perhaps the court was thinking it could force new elections that would weaken the AKP’s power, thus damaging its chance to push through any pro-Kurdish reforms. 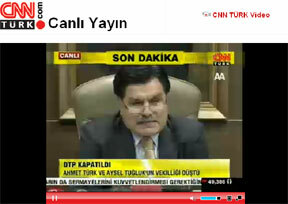 Ahmet Türk along with Aysel Tuğluk have been removed from Parliament, but not the other 19 DTP members. The choice for the remaining parliamentarians is to stay on and fight in Parliament, as Türk would like to see happen. Emine Ayna, DTP deputy chair, on the other hand, seems to favour a complete withdrawal from Parliament. Should the 19 stay, and if they are able to garner the support of one more parliamentarian, they could then form a parliamentary group with the Peace and Democracy Party (Barış ve Demokrasi Partisi), the BDP. The BDP was formed in early 2008, just a few months after the indictment against the DTP was announced in November 2007. Tomorrow’s party congress in Diyarbakır will help determine the fate of Kurdish politics in Turkey. The DTP and its lawyers are also preparing to appeal the party’s closure at the Strasbourg-based European Court of Human Rights. 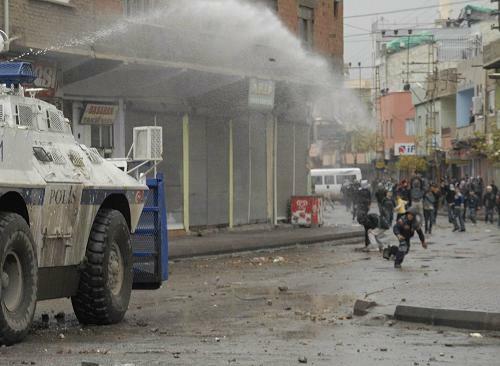 Meanwhile, clashes have erupted in Istanbul, Diyarbakır, Yüksekova, and other cities between Kurdish demonstrators and Turkish security police. Protests in some areas have turned violent with protestors throwing Molotov cocktails. 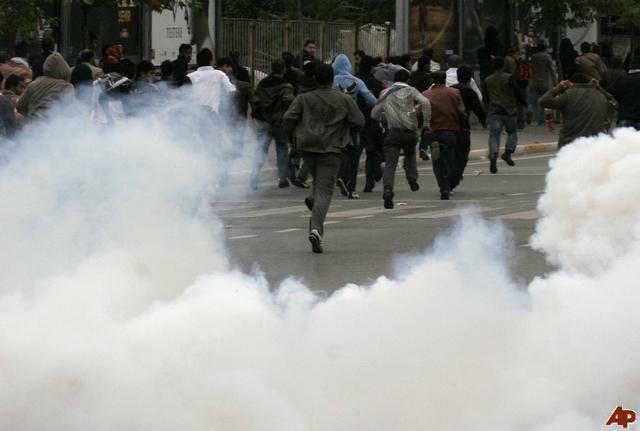 In Istanbul police broke up clashes between demonstrators and local residents wielding clubs and knives. There are reports of detentions, hospitalisations, and at least one death. A story from today’s radio show on National Public Radio in the US. Discusses Turkey’s ‘Democratic Initiative’, the possible ban of the DTP, recent protests, language laws, human rights issues, etc. A good story (just over 5 minutes in length). And great to hear news about the Kurds on a major news outlet. Ahmet Türk of the DTP says the Turkish government needs to include education in Kurdish in its Democratic Initiative. Without mother-tongue education, he says, there will be no solution to ongoing problems. Kurds in Turkey have long sought public education in Kurdish, a language spoken by millions of people there. Back in February Türk spoke Kurdish in parliament in recognition of International Mother Language Day to raise awareness of language disparity issues in Turkey. Mother tongue education is the idea that a learner is taught the fundamental concepts of a topic in their first language (Kurdish). The idea being that children absorb concepts easily in their own familiar languages and can gain a fundamental understanding of them. But in a second language (Turkish) they simply become words that are learnt, but not absorbed. If children are to reach their full educational potential, it is extremely important that the grounding of these learners be made in their mother tongue. Kurdish, not Turkish. Mother-tongue medium education, simply put, is formal education in the language you speak at home with your parents and siblings. The most central of linguistic human rights is the right to mother-tongue medium education in state schools. All state-run schools in Turkey, however, use only Turkish. There is no Kurdish public education at all. Many Kurdish children arrive on their first day of elementary and do not know any Turkish. Teaching through the medium of a dominant language, in this case Turkish, is subtractive. That is, Turkish is learned, not in addition to, but rather at the expense of, the child’s mother tongue, Kurdish. Subtractive education which replaces the children’s mother tongue is genocidal, according to the UN Genocide Convention definition of genocide. The Turkish educational system is a direct agent in Kurdish cultural and linguistic genocide. Yes, it is genocide. It forcibly transfers children from their own cultural and linguistic group to another one. Lack of mother-tongue education is not the only hurdle to education for Kurds in Turkey. The lack of school buildings for primary education also contributes to the low rates of schooling. Most of the almost 6,000 primary schools in the Kurdish regions of SE Turkey are deficient in basic educational material and equipment. There is also a shortage of educational instructors, which results in high student-teacher ratios. Up to 90-100 students per qualified instructor in some areas. The average in western Turkey is 19 students per teacher. 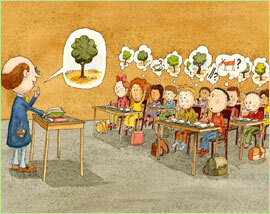 The major stumbling block to Kurdish educational rights, however, is the Turkish constitution. …no protection shall be accorded to an activity contrary to Turkish national interests, the principle of the indivisibility of the existence of Turkey with its state and territory, Turkish historical and moral values or the nationalism, principles, reforms and modernism of Atatürk. Articles 3 and 42 of the Constitution state that the official language of the state is Turkish and that no other language other than Turkish can be taught to Turkish citizens in any educational institution. And the Turks mean any educational institution. It doesn’t seem to matter if the educational institution is even in Turkey. An example cited by Amir Hassanpour in his article ‘Kurdish Language Policy in Turkey’ talks about how the Turkish Embassy in Copenhagen tried to stop a Kurdish language training course for Kurdish teachers there by saying that ‘participants were still Turkish citizens and were thus not entitled to break Turkish law.’ To wit, being educated in Kurdish. The CHP (People’s Republic Party) has stated flatly that education in the Kurdish language is one of their red lines not to be crossed. CHP leader, Deniz Baykal feels that granting the right of education in languages other than Turkish would lead to division of the country. And many in Turkey share his views. Prime Minister Erdoğan has said that assimilation is a crime against humanity and that children should get educated in their native language. Was he speaking about Kurdish children in Turkey? No. He was speaking about Turkish children living in Germany during his recent visit there. And now Turkish children at schools in parts of Germany will receive an education in their mother tongue. But apparently this multilingual approach to education is too controversial for Turkey. According to Clair Thomas, an author of the recent report ‘The State of the World’s Minorities and Indigenous Peoples 2009,’ policymakers often mistakenly believe that education in a home language will mean that children will never really master a national or majority language. 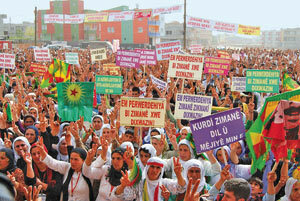 Kurdish move not satisfactory, says DTP leader. Hürriyet Daily News, 30 November 2009. Çalişlar, Oral, Why would education in Kurdish separate Turkey? Hürriyet Daily News, 02 September 2009. Rizvi, Haider. Mother Tongue absent in thousands of classrooms. IPS News, 16 July 2009. Hava, Ergin. German schools to give Turks education in mother tongue. Today’s Zaman, 27 November 2009. In a press conference on Monday, Democratic Society Party (DTP) leader Ahmet Türk, said his party will act more sensitively when it comes to the return of PKK-affiliated groups. “It can only be the job of irresponsible politicians to describe a small step on the road to peace using inflammatory words such as winning, losing and surrendering,” Türk said. Türk strongly criticised both the Republican People’s Party (CHP) and the Nationalist Movement Party (MHP) saying that they “are trying very hard to reverse the process because they have nothing to offer society apart from conflict, bloodshed and tears.” He called their approach to the democratisation process racist, separatist, and dangerous. Deputy Prime Minister Bülent Arınç said the government has no intention to give up on the solution process because it is Turkey’s “last chance” to solve the decades-old Kurdish problem. “This process will continue and has to continue. No matter what its consequences and risks will be, we are intent on carrying out this initiative, which we have launched for the benefit of Turkey,” Arınç said. He said they are anticipating more PKK groups in November. DTP promises more sensitivity with upcoming returnees. Today’s Zaman, 27 October 2009.